After years of research and experiments, Rejuvi Laboratory has developed a unique formulation - Scarcare Formula with synergistic Aftercare kit for all types of scars particularly for intractable keloid or hypertrophic scars. 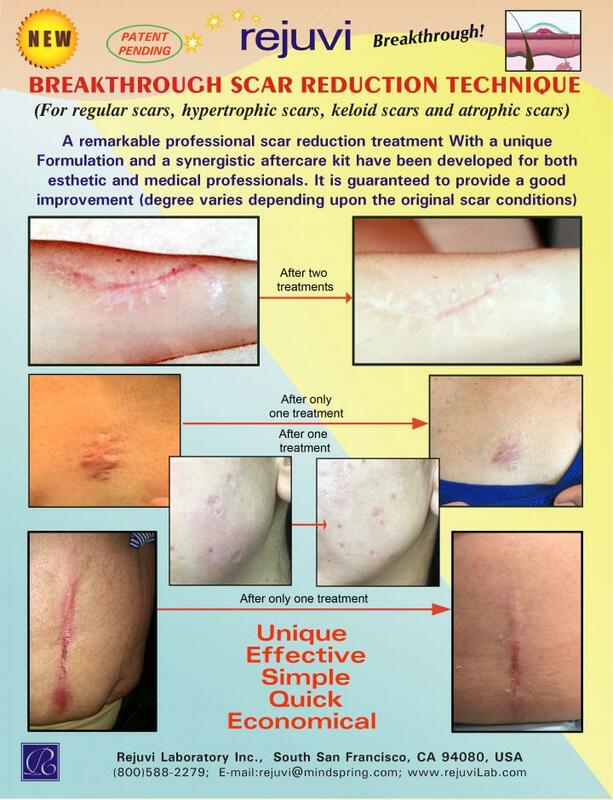 This is a breakthrough and revolutionary anti-scar technology. It is considerably more effective than all existing topical products including expensive laser or IPL methods. The professional treatment (Scarcare Formula) should be performed by esthetic or medical professionals. It takes about 40 minutes for one treatment session and the treated area should not have any water contact for minimum 48 hours. Then Rejuvi Scar aftercare kit must be used at home (3 products - Conditioning Oil, Retinyl Serum and Scare care Gel). The Professional scar treatment can be performed after 15 days or longer and several professional treatment can be made until a desirable improvement is achieved. A good improvement can be observed as quickly as 15 days. Rejuvi scar reduction technology is unique, effective, synergistic, simple, quick and cost-effective. A good result is guaranteed ! It is U.S Patent pending ! Famous SKIN INC magazine published the article -Scar Reduction Made Simple in May 2018 issue.